If that inspires you to stamp a fun card, this is the set for you. I love 'Tini Time from the Mad Men martini glass, to the silly sentiments and the 60s graphics. And it is a great 10% off this month! I love creating my own patterned paper using rubber stamps, and that is just what I did here. 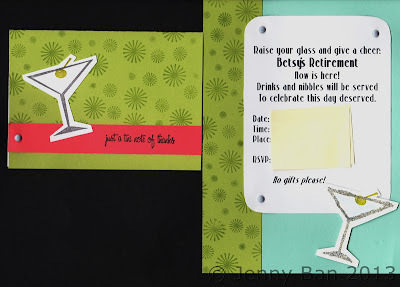 Here is an invitation I was asked to make for a retirement party (excuse the post-it covering up the personal info.! ), and the accompanying Thank You note. The invitation is a 5" x 7" card, the thank you is a 4-bar.